(By CSZ Sports Writer Kenn Staub) With spring just around the corner high school sports begins making the transition from the gym to the field. Bobcat head baseball coach Rob Jewett, for one, is looking forward to this transition and seeing his team on the diamond. “I’m excited to see what kids can do in certain positions, certain situations. We’re going to be playing a lot of guys in a lot of different positions to what our solidified line up might be. So it’s going to be exciting as a coach to see who can do what,” said Jewett. The Bobcats, 10-8 a year ago, have previously found success through a combination of pitching and fundamentally sound defense. “So far, we’re only a week in, but I like what I see out of my pitchers. I’ve got a solid group of pitchers, with some young guys coming in that can eat up some innings as long as we throw strikes. So I definitely like that,” commented Jewett. Projected staff ace Skylar Rhoades. The Bobcat rotation will be looking to replace last year’s ace, Cam Craig, relying heavily upon Skylar Rhoades, Skyler Pastor, and Chase Kriebel. Rhoades, the most experienced of the Bobcat trio, threw 28 innings in eight outings last year, compiling a 4-4 record with a 4.00 ERA. 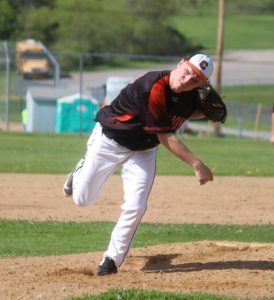 The hard throwing junior led the Bobcat staff in strike outs, fanning 37. Pastor, also a junior, made seven appearances, tossing 10 innings. He had a 1-1 record and converted both his save opportunities, striking out 15 along the way. Kriebel is a freshman who Jewett said throws hard. Also working out on the mound in the preseason have been Cal German, Lake Staub, Nate Datko, Christian Simko, Breckin Rex, and Cam Lapinto. “Cal is going to eat up some innings, but I have plans for him playing short so I don’t want to throw him too much. So it’d be nice if he could come in as a closer, a one inning type pitcher,” noted Jewett. German, a sophomore, pitched in four games during 2018, throwing three and a third innings. Staub threw an inning of relief against Union. Lake Staub catching against Keystone last season. Discussing his team defensively, Jewett referenced the need to replace experienced, multi-year starters lost to graduation, including Craig, Spencer Miller, and Sterling Conner. Miller, the team MVP last season, was a two time All-KSAC infielder, while Connor made the all-conference second team twice. 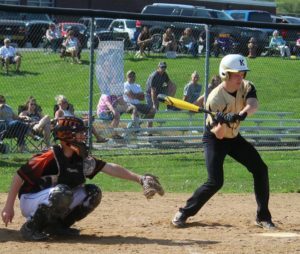 Looking to fill in the backstopping hole left by Conner are Staub, a junior, and sophomore Cole Slaugenhaup, both of whom saw time behind the plate a season ago. Staub, more of a defensive specialist, played in 14 games and drove in four runs. Slaugenhaup hit .207 and plated three in 17 games split between catching and playing third base. Jewett has also had Lapinto, a freshman, working out at catcher and may try another freshman, Ryan Alston, there as well. Jewett noted that whoever isn’t catching will more than likely find himself manning the hot corner, or even another infield position. “With some of those catchers being able to play multiple positions too… If I have to throw them at second, they’re going to go to second. If I have to throw them at first…,” said Jewett. The Bobcat’s lone senior and projected first baseman, Drew Wrhen. Pencilled in at first base is the squad’s lone senior, Drew Wrhen. Wrhen played all 18 games at first last season, hitting .240 and driving in ten. Kriebel and fellow freshman Simko are also in the mix to see playing time. Getting a look at second are Noah DiTullio, a sophomore, and freshmen Rex and Alston. DiTullio played 11 games at second in 2018, hitting .118 and driving in two. Shortstop appears to be German’s, who primarily played in the middle infield last season. In 15 games he batted .179, plating two. Rhoades might also fill in at short when not pitching or playing the outfield. Juniors Nate Datko, Pastor, and Rhoades will all find themselves in the outfield. Datko, a two year starter primarily in left, hit .172 in 17 games and drove in five. Pastor, who also plays first, batted .133 in twelve games. Rhoades, a two-time All-KSAC outfielder, batted .385, driving in 19. Also vying for playing time are, among others, freshman Cole Wrhen, Simko, and Rex. An intriguing member of this year’s team is junior Johannes Kuhn, an exchange student from Germany. “This is his first year playing. I probably see him playing a little bit more outfield. He’s definitely raw, he’s never played the game before. Already in a week he’s made a lot of improvement. He plays a lot of soccer, not baseball. Should be fun seeing how he does,” said Jewett. 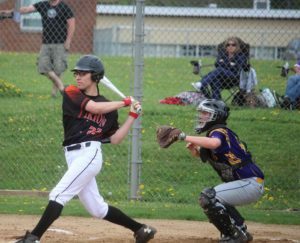 Nate Datko hitting against North Clarion a year ago. 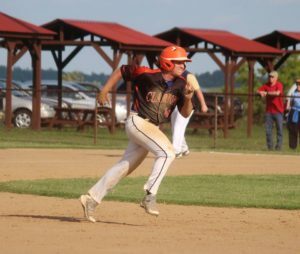 A point of emphasis for the Bobcats going into the 2019 season is hitting, as they return only one player, Rhoades, who batted above .250 last year. Jewett will be assisted this season by Lee Weber and Tanner Klein, both knowledgeable baseball coaches. Despite his team’s relative inexperience, Jewett has set some lofty goals for the Bobcats, which remain the same year in and year out, and those which are a bit more modest. The Bobcats open the 2019 regular season on Monday, March 25 with a 6:00 game against Karns City at Pullman Park in Butler.